It is a great honor to be here with you, especially because of the example set by the Bipartisan Task Force on Nonproliferation and its co chairs Congressman Chris Shays and Ed Markey. I would also like to thank the Bipartisan Security Group, and its group of experts like its Chairman Ambassador Thomas Graham, and my friend Jonathan Granoff. I support and applaud your efforts. A wise person recently pointed out that no one has ever washed a rental car. Why bother if you don’t own it? When people are engaged in a process, they are far more likely to support its outcome. Nations behave the same way. In 1945, the United Nations was founded with one major goal in mind, and I quote, “to save succeeding generations from the scourge of war.” The founders noted that twice in the 20th Century major wars had brought “untold sorrow to mankind.” Since its founding, 191 nations have joined the UN. We have no other place where all nations can work together for peace, a place where we can use verbal conflict rather than armed conflict to solve problems. And often, the UN, with US support, has provided armed force to help ensure the peace. The entire planet now faces global challenges including ensuring bio-diversity and ending the destruction of thousands of species; reversing the depletion of fishing stocks; controlling ocean dumping; preventing ozone depletion; halting global warming; controlling and eliminating terrorism and weapons of mass destruction; fighting pandemic diseases; ending the tragedy of crushing poverty and lack of clean drinking water; and addressing crises arising from failed states. No nation or even a small group of nations can succeed in addressing these issues alone. If the application of solutions appears to be done only through the orders of decision-makers in Washington, DC, in derogation of the UN, the results will be cynicism, lack of cooperation, and ultimately failure. Failure is not something we can afford. Working with the UN, I can tell you that America’s interests are best served when others want to emulate our good example. America’s interests are best served when we act in coordination with other nations, and when we demonstrate our values by our actions. Franklin Roosevelt defined those core values as four freedoms: freedom of speech and expression, freedom of every person to worship God in their own way, freedom from want, and freedom from fear. That is the America the world has come to love. The United Nations is based on political insights that have led to successful governance principles and enhanced the wealth of nations. These values include market freedoms, religious liberty, an independent judiciary, government transparency and accountability, democracy, and a high level of respect for civil liberties and human rights. They have evolved into nearly universal goals and norms. The countries that have adhered to these principles are the most secure and healthy. The United Nations is guided by such countries, and simultaneously provides the only viable forum for the expression of the aspirations of the poor and the weak. The establishment of international norms of conduct is where idealism informs realism. These powerful principles are not mere abstractions. Recently, I visited Sierra Leone, where I saw the consequences of failure to abide by these norms: child soldiers; severed limbs; disrupted lives; suffering beyond words. Global issues distill to the particulars of individual lives. Our capacity and responsibility to enhance so many individual lives should not be taken lightly. We are called to nothing less than moral leadership. When moral leadership is coupled with power, it galvanizes the world. Moral leadership requires living up to one’s promises and commitments. Fulfilling our promises in the Nuclear Nonproliferation Treaty, now with 188 member States, must be a primary aim. This Treaty, essential to our security, will be reviewed formally in 2005 at the UN. There are tens of thousands of nuclear weapons in the world, over 90% are possessed by Russia and the US. Most are many times more devastating than those used on Hiroshima. The arsenals of Russia and the US are armed, targeted and poised, waiting for three short computer signals to fire. These hair trigger devices represent the devastation of approximately 100,000 Hiroshimas and pose a horrific threat to life. The use of a nuclear weapon could take place by accident or design by states, or even terrorists. These weapons pose an unacceptable risk to the planet. We must demonstrate our unambiguous commitment to fulfill our promises. Otherwise, the prospect of more nuclear weapons states, and the construction of new nuclear weapons, will only increase human peril. The world needs a more effective nonproliferation and disarmament regime and is looking to us for leadership. The drafters of the United Nations Charter created a harmonious system that permits dynamic and broad engagement through the General Assembly, the Security Council, numerous agencies and the Secretariat. The present situation in Iraq presents us with the opportunity to re-affirm our commitment to the principles that guide the UN. Regarding the reconstruction of Iraq, it has become clear that there is no substitute for UN cooperation for legitimacy and effectiveness. Additionally, we should support Secretary General Kofi Annan’s call for reform and strengthening of the UN system. This is the best way to satisfy all the members of the international community, demonstrate American leadership, and make our world more secure. America can be proud when we lead by inspiration rather than by coercion. America can be proud to have proven that the human condition is advanced when power is shared. It is an affirmation of faith that the inefficiencies of discussion and debate, of checks and balances, ultimately build better governance than authority centralized in unaccountable hands. Let America’s hands be as open as our hearts. Let America’s spirit of cooperation be based on our vision of democracy. Let America engage the international community more deeply, and more formally. When we have confidence in working together, others will have confidence to work with us. The call based on “we the people” opened new vistas of government based on principles of participation and inclusion. That call for inclusion was heard around the world when our great nation was born. Less than two centuries later, the resonance of that call helped form the United Nations. We, today’s champions of that call, can and must lead with pride. 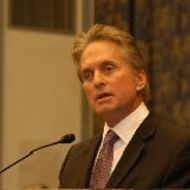 Biography: Film and television actor and producer Michael Douglas has demonstrated a strong commitment to disarmament, including nuclear non-proliferation and stemming the tide of small arms and light weapons. Mr. Douglas has promoted abolition of nuclear weapons as a moral imperative. He has also spoken out in favor of greater controls over the illegal possession and circulation of small arms and light weapons. He has helped promote an innovative UN program of weapons recovery in Albania, encouraging people at the community level voluntarily to return arms in exchange for development assistance. He also recently visited Sierra Leone and filmed a documentary on children soldiers co-produced by RCN Entertainment and the United Nations for Showtime. He was appointed a UN Messenger of Peace in 1998. “The Limits of Unilateralism” presentation at the U.S. Congress October 2, 2003 was hosted by the House of Representatives Bipartisan Task Force on Non-Proliferation in cooperation with the Bipartisan Security Group, which is a program of the Global Security Institute. For more information about the Task Force, please contact Ramsey Hoguet (Rep. Markey) at 202-225-2836 or Jordan Press (Rep. Shays) at 202-225-5541. For information about the Bipartisan Security Group, please contact Ambassador Robert Grey at 202-543-9017.